Dennis and SISIS returned to GIS 2014 in Orlando and reported a successful launch of two products as well as interest in the current range of turf maintenance products from both brands. 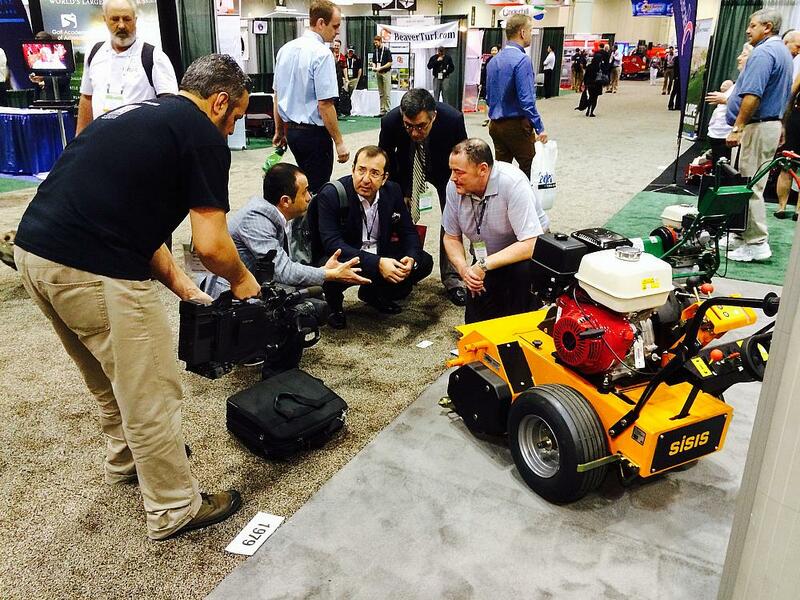 "It was good to be back in the US to launch two new products from SISIS as well as showing the Dennis FT510 interchangeable cassette cylinder mower,” commented Ewen Wilson, export sales manager for Dennis and SISIS. “As well as showing products from both brands, it also shows our commitment to our export markets. From that point of view; it was a great show as we met so many customers from not just across the US but also Europe, Asia and South America." The two new machines from SISIS, which made their first appearance at IOG SALTEX in September before being shown at BTME in January were the Rotorake TM1000 tractor mounted scarifier and Rotorake 600HD pedestrian scarifier and linear aerator. The Rotorake 600HD can be used for regular, routine use at a shallow setting or a deeper setting as and when required. It also contributes to aeration and compaction relief by cutting clean, continuous slits to assist water and air absorption. A new modern design with more responsive manoeuvrability makes the Rotorake 600HD even more operator-friendly. The SISIS Rotorake TM1000 is a tractor mounted unit which is now available with five quick release interchangeable reels to aid the removal and control of thatch and help reduce standing surface water by improving water infiltration. Like other scarifiers in the SISIS range, the Rotorake TM1000 works on the successful contra-rotating principle for a clean, consistent performance with a selection of blades to suit key seasonal tasks. Unique features of the re-designed product include a floating unit to follow ground contours, a range of five quick release interchangeable reels and optional spacing for scarifying, linear aeration, verticutting and brushing and a ‘no tools required’ depth setting ensuring fast, simple adjustments can be made. The weight of the collection box and material is carried by the main frame on the front roller and is totally independent from the reel, which means when the machine is in use, the additional weight does not force the reel to scarify deeper than the user has set it.